With state-of-the-art technology at their fingertips and a fierce compassion for children, our Pharmacy Department works hard to provide superior care to our pediatric patients. We value our pharmacists for their expert knowledge and their patient-centric values. If you are a bright, warmhearted individual with a compassion for children, Valley Children’s Healthcare needs needs you. Enjoy comprehensive benefits, an employer-sponsored retirement plan, paid time off, and relocation options. Join our pharmacy team and you will truly make a difference in the lives of children and their families. Plus, you will open yourself up to a wide array of opportunities. Our Pharmacy Department serves our patients in a variety of ways. Our inpatient pharmacy, also known as the Central Pharmacy, dispenses and prepares the vast majority of the medications for our patients. Pharmacists review drug orders and are available for drug information 24 hours a day, 7 days a week. The Oncology pharmacy, located in the Craycroft Cancer Center, primarily prepares chemotherapy medications. Located on the second floor, the ICU pharmacy serves the PICU and NICU. Our ICU pharmacists produce most of the acute or “first doses” for our critically ill patients. 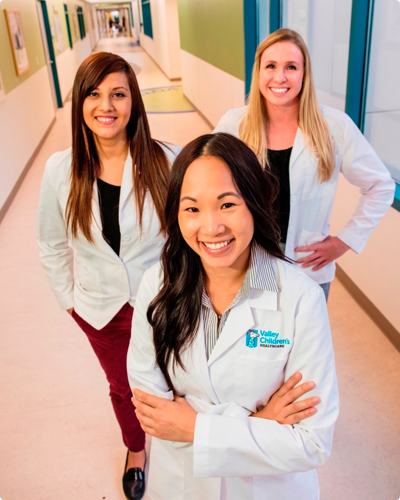 These pharmacists are available to provide clinical services rounding with medical teams. We are proud to have two clinical pharmacies: the Garden Pharmacy, located near the Starship Apollo and Starship Discovery Inpatient Units, and the Starship Explorer Pharmacy, which serves Starship Explorer and Starship Voyager Inpatient Units. A fully automated robotic system that utilizes barcode technology to dispense medication. Bedside Medication Verification system that allows nurses to log each dose in the patient’s electronic medication administration record. An automated medication dispensing machine network that enables nurses to access medications on demand and reduce drug wait time. Total Parenteral Nutrition (TPN) Compounder which accurately mixes TPN solutions. A computerized prescription writer that allows physicians to electronically send prescriptions to the pharmacy or printed on tamper resistant paper. Are you a recent graduate or current student? We offer a one-year postgraduate residency program in pharmacy practice with an emphasis in pediatrics as well as a one-year fellowship in critical care pediatric clinical pharmacy. Valley Children’s is also a rotation site for pharmacy students to complete their advanced pharmacy practice experiences. Search the jobs below, if you don't see your ideal role join our Talent Community.